Giant-Killing Louisville Women Look To Keep Charmed Run Alive : The Two-Way The Louisville women haven't beaten UConn in 20 years — including a 22-point loss to the Huskies in the 2009 women's national championship game. And Connecticut breezed in their last matchup in January. But as any tournament watcher knows, January is ancient history when it comes to March — and April — madness. Tonight, there's a chance for a rare double in NCAA Division I college basketball. As we reported earlier, if the University of Louisville scores a victory in the women's championship game, it will be only the second school to capture both the men's and women's titles in the same year. There's also a good chance that as the Cardinals prepare to enter the New Orleans Arena this evening, their pregame preparation will include a directive from head coach Jeff Walz, to savor it all. That's what Walz has been saying throughout Louisville's charmed run in the tournament, as the Cardinals took down the giant of women's basketball – Baylor — and then followed it up by beating another storied program, Tennessee. And he said it before the semifinal victory over California. "He [Walz] told us before we went out on the court to 'stop for a second at the end of the hallway and look around in the stands and see all the banners and all your fans,' " says Louisville forward Sara Hammond. "He said, 'Just soak it in for a moment, and then when you step out on the court, go have fun and put a smile on your face.' "
But history says those smiles will fade and be gone by evening's end. The Louisville women haven't beaten UConn since 1993. Yes, that's 20 years ago. That streak includes a 22-point Connecticut win in the 2009 women's national championship game. Their most recent meeting was in January when the Huskies breezed, 72-58. As any tournament watcher knows, however, January is ancient history when it comes to March — and April — madness. Teams evolve over the course of a long season, and that's certainly the case with Louisville, which is playing its best basketball right now. The Cardinals are confident and cohesive. "Our team chemistry is outrageous right now," says star guard Shoni Schimmel. The bad news for them, though? Connecticut is also playing its best. The Huskies have won their five tournament games by an average of 35 points. Their calling card, defense, has limited those opponents to an average of 49.8 points per game. And the well-rounded and deep UConn team appears to have a breakout player at just the right time, too. Freshman Breanna Stewart didn't play in that January victory over Louisville. The 6-foot 4-inch forward was injured. On Sunday, Stewart established herself as the heir apparent to next-great-UConn-player honors, pouring in 29 points and racking up five rebounds and four blocked shots in a semifinal win over Big East arch rival Notre Dame. Stewart will be tough to cover tonight with her size and athleticism and range — she scores inside and just as easily from three-point range. But Stewart is only one of the obstacles Louisville faces. According to SI.com, the Huskies play an eight-woman rotation that includes five players averaging more than 9.1 points per game. Indeed, before Stewart's trumpet blast of a performance, the skinny on Connecticut was they're not a team of stars, but a collection of really good players, any of which can rise to stardom on any given night. That said, what Connecticut does best is play defense. To repeat, the Huskies have held tournament opponents to an average of less than 50 points per game. Even Louisville head coach Walz acknowledges that low scoring is not going to cut it tonight. "If we have a chance to win," he says, "it's not going to be a 60-55 game. It's got to be 84-83. We might have to try and get up into the 90s if we can." 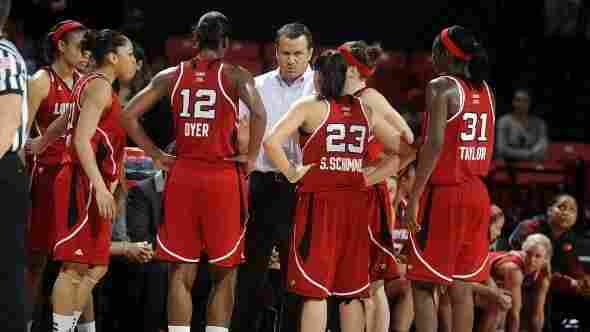 The Cards did hang 82 points on Baylor, the best team in women's basketball the past two seasons. For Louisville to break through against UConn, Schimmel most likely is going to have to work her all-court magic ... and then some. The team also will have to find a way to get guard Antonita Slaughter as open as she was in the semifinal win over Cal. She hit 6 of 10 three-point shots. Louisville will have to play its wide open style and defend waves of UConn players, as well. "We're going to have to play better than we played against Baylor, better than we played against Tennessee and Cal," he says. "We're going to have to play 40 minutes of pretty much perfect basketball." The key words are "40 minutes." As Walz has said several times, this isn't the NBA playoffs. No best four-out-of-seven game series. It's 40 minutes. One night. And so far, the Louisville Cardinals have been the masters of one night. 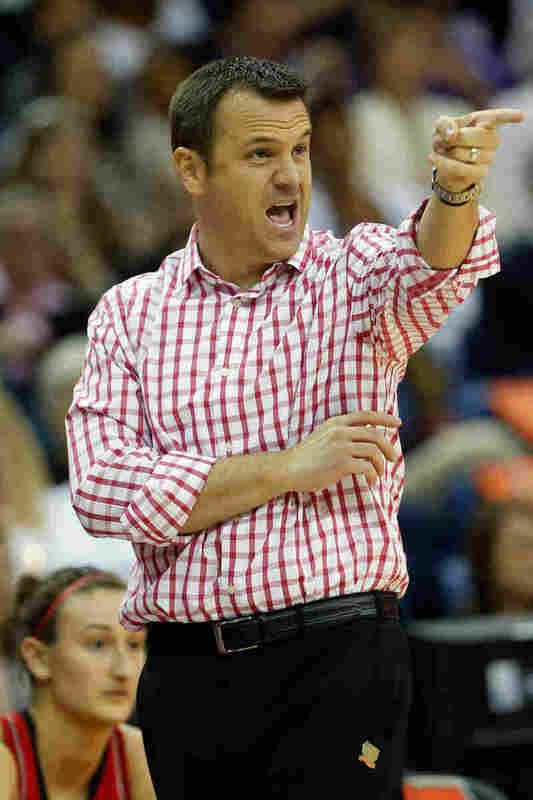 In the comic highlight of the women's tournament, UConn head coach Geno Auriemma, as much a wise guy as he is a great basketball coach, suggested the red-and-white checked, open-collared shirt Walz wore during the California win looked like a tablecloth. And with that kind of shirt, Auriemma said, Walz could work in his new restaurant. Without flinching, Walz said later that he would leave his post at Louisville to go be the head waiter in Auriemma's eatery, and that it would be a great honor. Not to be outdone, Auriemma cracked: "He doesn't dress well enough to work in the front room of my restaurant. So he'll be bussing dishes and taking out the trash in the back until he fixes his attitude." Both coaches, who also talk about their great respect for each other, had a good laugh. But tonight, the odds are heavy that Walz's Louisville Cardinals will be cleaning up --after the Huskies feast on a record-tying eighth women's national championship.